Sentech AS have a proven track record in heavy oil applications, which keeps leading us to new customers by word of mouth within this industry segment. 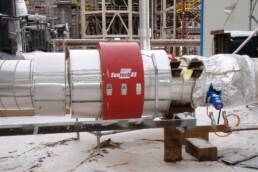 24″ Sentech Water Cut Meter in oil sands pipeline, installed in 2006. 32 SeCaP sensors detect flow profile and provide alarm if water is separating along bottom of pipe, as this would cause risk of water freezing along length of pipe.